The G51 graphics processing unit is the second one to use the Bifrost architecture and also ARM's most area-efficient and energy-efficient GPU to date. The V61 provides 4K120 video with increased efficiency. Both should be available in products for consumers next year. Earlier this year, ARM unveiled the new Bifrost GPU architecture, also detailing the Mali-G71 graphics processing unit as the first one to use it. In the meantime, this GPU already made its way into chips like the Huawei HiSilicon Kirin 960. Now, the time has come for a second Bifrost-based GPU to be unveiled. Dubbed Mali-G51, it has been announced next to the Mali-V61 VPU. According to ARM, the new Mali-G51 is its maker's "most area-efficient and energy-efficient GPU to date." 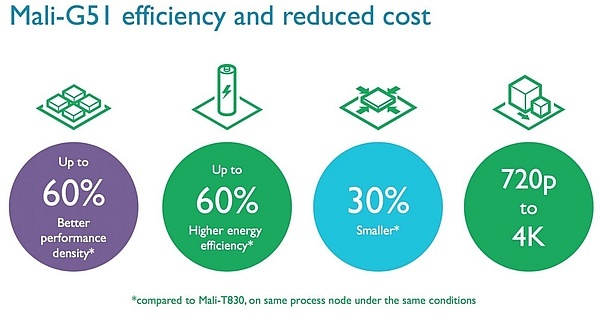 The chip maker claims this new processor "delivers up to 60 percent more performance per square mm and is up to 60 percent more energy-efficient than its predecessor, the Mali-T830." At the same time, the new GPU is 30 percent smaller than its predecessor as well. The Mali-V61 promises to provide "the most efficient 4K live streaming" for apps such as Periscope and Facebook Live. ARM says the Mali-V61 supports [email protected] fps streaming on a single core, and up to 4K120 on multiple ones. Both chips have been designed to interact as parts of the wider Mali Multimedia Suite and ARM Cortex-A processors. They are available to license now, and we should see the first products to use them in 2017.